Guess what everyone? I have cool stuff to share! Or cool stuff to make you jealous with, depending on your situation lol! First of all, last week I received an early Christmas present from Nintendo. It was my Club Nintendo Platinum Status reward! 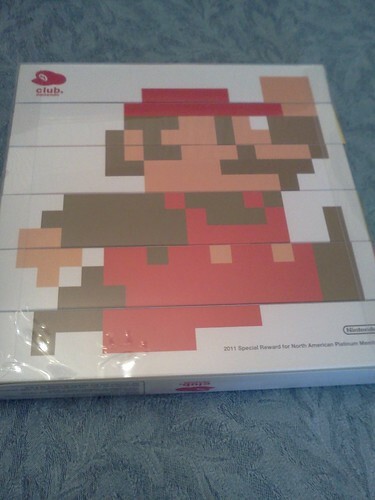 The 2011 rewards for Club Nintendo were either a Desk Calendar (Gold Status – I got a very similar one last year) or a Super Mario 8-Bit Pin Set (Platinum Status). Obviously I had to go for the exclusive Pin Set, and it has finally arrived! Here are the photos I took – sorry for the glare in the pictures! It has a plastic casing around it and I didn’t want to take it off. Here you can see most of the pins. They are really cute! I was going to pin them onto my Super Mario duffel bag but I think I’m just going to keep it in this display case thing. Why? Cuz look at the other side! 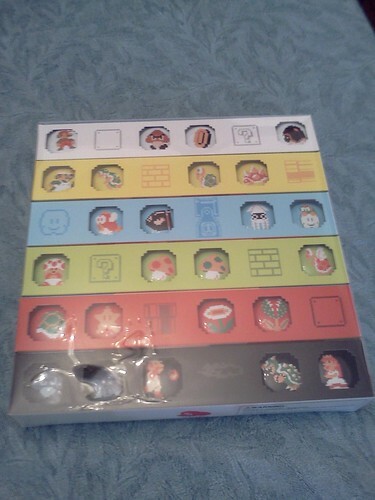 The backside of each row of pins comes together to create a large 8-bit Super Mario graphic! It’s just too cool. Maybe it’ll be rare and collectible someday. I’m keeping it in the case lol! So if that wasn’t enough to make you jealous (unless you already got this same Platinum reward hehe) I have a unique, one-of-a-kind goodie to gloat about! 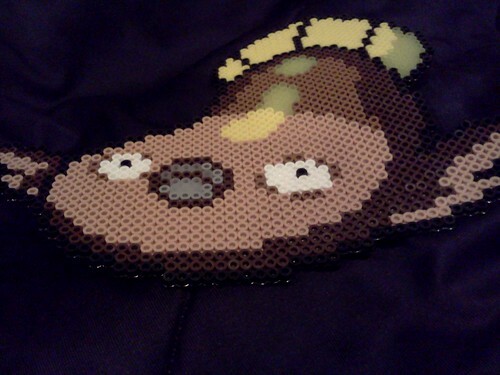 My awesome boyfriend JDubz MADE me a Pokémon out of perler beads! I’m pretty psyched for Yoshi’s Island, Minish Cap, Kirby, Mario Kart and Wario Land! But with all the amazing games that I have right now, like Harvest Moon and Mario Kart 7, when will I have time to play these? By the way, here’s something that almost every Nintendo fan can enjoy. Club Nintendo recently had a big design overhaul. So log on to Club Nintendo today and see the new rewards and stuff! Enjoy!